^ Андерсон, Уильям Роберт. "Наутилус" у Северного полюса. Воениздат. 1965 [2012-01-12]. ^ Mouton, M.W. The International Regime of the Polar Regions. Acadimie de Droit International de La Ha. 1968: 202 (34) [2012-01-12]. ^ John K. Wright Geographical Review, Vol. 43, No. 3. (Jul., 1953), pp. 338–365 "The Open Polar Sea"
^ Tierney, John. 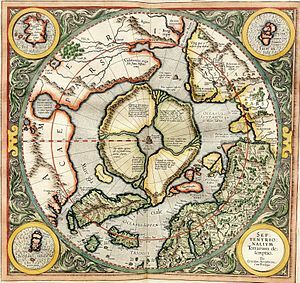 (2009-09-07) Who Was First at the North Pole?. Tierneylab.blogs.nytimes.com. Retrieved on 2012-07-04. ^ Sea Ice. Sate of the Cryosphere. NSIDC. [6 March 2012]. ^ "Arctic ice thickness drops by up to 19 per cent", Daily Telegraph (2008-10-28). ^ Model-Based Estimates of Change. IPCC. [6 March 2012]. ^ Jonathan Amos (2006-12-12). Arctic sea ice "faces rapid melt", BBC. ^ Future of Arctic Climate and Global Impacts. NOAA. [6 March 2012]. 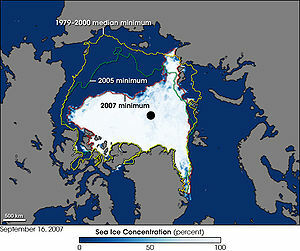 ^ Explorers' Blog 互联网档案馆的存檔，存档日期2007-10-13., Greenpeace Project Thin Ice (2006-07-01). ^ 21.0 21.1 FARTHEST NORTH POLAR BEAR (Ursus maritimus) (PDF). [2011-02-16]. ^ Russia plants flag under N Pole, BBC News (2007-08-02). Magnetic Poles locations since 1600 Download the KMZ file. For Google Earth Users.